The patient was a twenty-four year old female with a long and complicated medical history. During infancy she developed seizures and was developmentally delayed. Her early childhood was characterized by progressive gait difficulties, mental retardation, lower extremity dystonia, dysarthria and dysphagia. Over the years the mental impairment and dysphagia progressed, requiring gastro-jejunostomy tube placement and intravenous supplementation, through a central line, for feeding. The lower extremity dystonia worsened requiring heel and toe cord releases, ankle fusion with bone grafts and silicone implants in the ankles. In addition she developed dysautonomia with hypotension, and chronic urinary tract infections (UTI) secondary to spastic bladder and reactive airway disease. She was hospitalized on numerous occasions for pneumonias, UTIs and sepsis, related to the central lines. Finally she developed severe bilateral bronchopneumonia and sepsis. 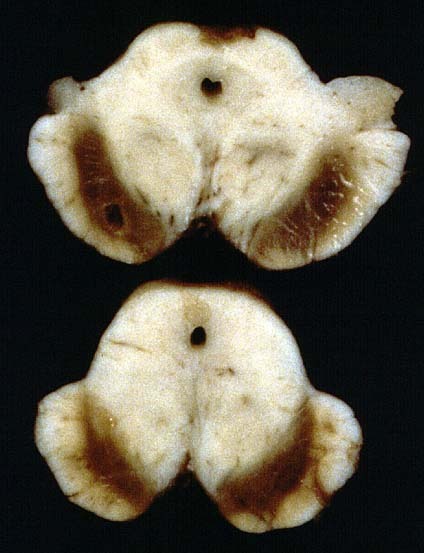 Coronal section of the brain at the level of the lenticular nuclei and mamillary bodies (Fig. 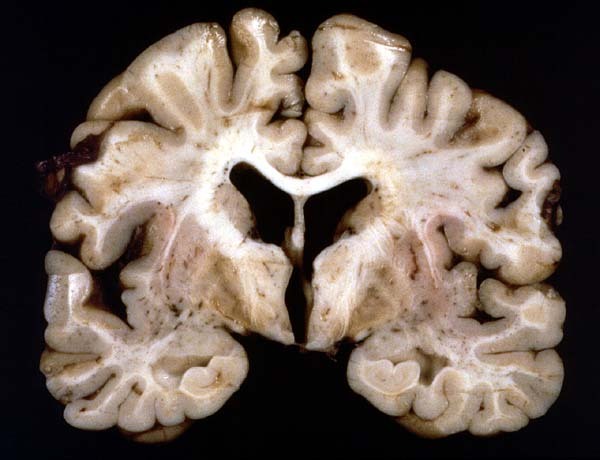 1) shows a brown-bronze discoloration of globi pallidi, diffuse cerebral atrophy and moderate ventricular dilatation. Cross section of the midbrain (Fig. 2) shows a dense brown-bronze discoloration of the substantia nigra.